Makes approx 60, depending on size. Thoroughly mix flour, baking soda, salt and spices. Melt lard in large saucepan. Cool slightly. Add sugar, treacle and eggs to saucepan and mix well. Add 4 cups dry ingredients and mix well. Turn mixture onto lightly floured surface. Knead in remaining dry ingredients by hand. Add a little more flour, if necessary, to make firm dough. On floured surface, roll out 1/8 to 1/4 in. thick for cut-out cookies. Bake on ungreased cookie sheet, small and medium-sized cookies for 6-10 minutes. Substitute 1 1/4 cups golden syrup for treacle to make lighter, slightly sweeter Gingerbread. If you want to make these for hanging on the Christmas tree, make a hole near the top with a skewer before baking, to thread ribbon through and bake them for 10 – 15 minutes. These are a lovely tasty way to say goodbye to Summer and they’re easy to make too. If you’ve visited my blog before you’ll most probably know I’m useless at making pastry, so I bought ready made all butter pastry cases. But go ahead and make your own if thats what your good at 😉 I used 8 pastry cases but you could use mini ones or make one large tart. In a small saucepan, combine all of the ingredients and bring to a boil over medium-high heat. Continue to cook for about 5 minutes, until thickened. Allow to cool for 15 minutes, then divide into the tart shells. Place in the fridge to chill. In a small bowl stir together the sour cream, brown sugar, and vanilla, until smooth. 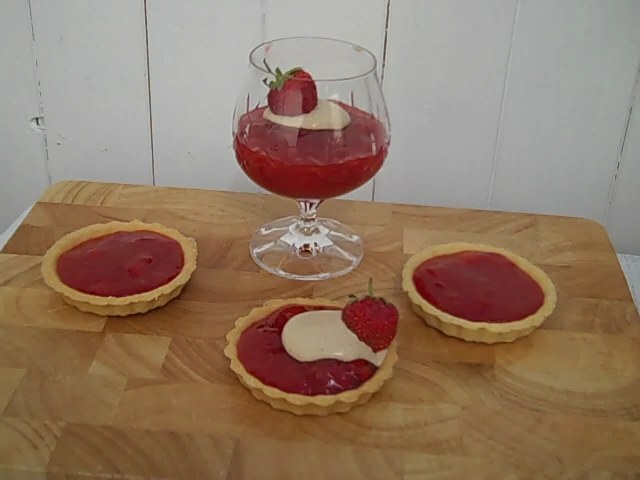 Dollop onto the chilled tarts, and top with a mini strawberry. Tip: This vanilla cream topping does not go thick like whipped cream. Best not to put on top of the tarts until your ready to serve. This cream is also delicious used for dipping fruit into. Now, whatever you do don’t try this while its still warm, you won’t be able to stop eating them. I know! Preheat oven to 175C /gas 4. Line a 21cm x 21cm baking tin with baking parchment. Cream together the butter, peanut butter, and both sugars. Add the eggs one at a time, beating a little between each addition. Add the vanilla. Beat in the flour, baking powder, and salt. Spread 1/2 of mixture in bottom of pan. Unwrap chocolate bars, break them up and layer them over mixture, leaving a little space between each one. Spread remaining mixture on top of chocolate and bake for 35 minutes. This is always a favourite.A nice moist cake with a lovely crunchy top. Line your tin/dish with baking parchment to fit the base and sides, I used a Pyrex dish 30 x 23 x 4 cm. Pre-heat the oven to 160°C/Gas 3. Measure all the ingredients for the traybake into a bowl and beat well for about 2 minutes until well blended. Turn the mixture into the prepared tin. Level the top gently with the back of the spatula. Bake in the middle of the pre-heated oven for about 40-45 minutes or until the traybake springs back when pressed lightly with a finger in the centre and the sides are begining to shrink away from the dish. 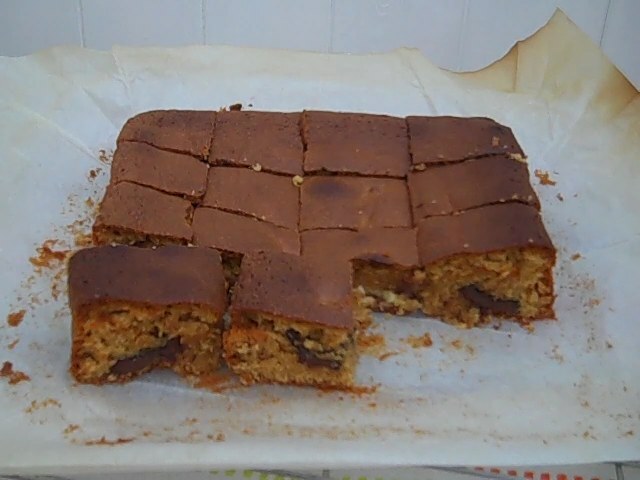 Allow the traybake to cool in the tin for a few minutes while you make the topping. To make the crunchy topping, mix the lemon juice and granulated sugar in a small bowl to give a runny consistency. Spoon this mixture evenly over the traybake whilst it’s still just warm. Cut into about squares when cold. 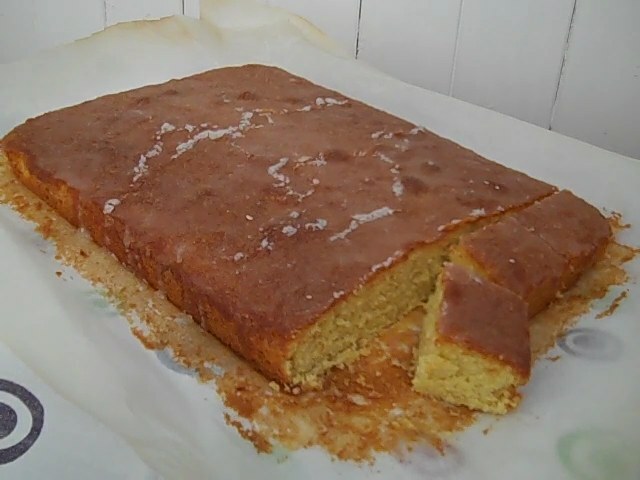 The cake needs to be still warm when the topping is added so that it absorbs the lemon syrup and leaves the sugar on top. Do allow the cake to cool a little though – if it is too hot the syrup will run straight through.